Candy Cane Cookie Recipe - Day 7 - THE OLIVE BLOGGER - Recipes your family will love! A delicious Candy Cane Cookie, perfectly soft and drizzled with white chocolate, it is the perfect cookie for dipping in your hot cocoa! Today’s cookie is a lovely addition from Gina over at Kleinworth & Co that will definitely brighten up your cookie trays! It is a soft Candy Cane Cookie that is drizzled in white chocolate and coated in crushed candy cane pieces. 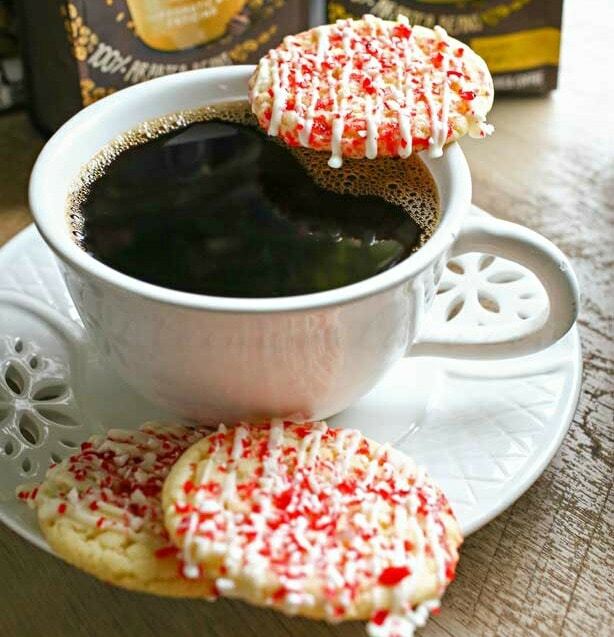 It is loaded with peppermint flavor and a perfect cookie for dipping in a cup of hot cocoa! I mean, come on right?! Don’t they just look so yummy?! I don’t know about you, but I am ready to get baking, and I am betting you have 90% of the ingredients on hand right now…follow along for the recipe below! Be sure to make a double batch so you have enough for yourself as well as gifting! A soft Candy Cane Cookie that is drizzled in white chocolate and covered in candy cane pieces! A perfect cookie for dipping in your hot cocoa! See site for instructions and the follow along for full 13 Days of Christmas Baking! get the full baking instructions at kleinworth & co: Click here! What do you think so far guys?! We are a week into our Christmas Baking Frenzy, with only 6 days left!!! Have you made any of the goodies yet?! What are your favorites?? I hope you’ll come back tomorrow and check out what is in store! What a great idea for a holiday cookie! I’ve never used peppermint in cookies before so I’ll definitely give this recipe a try! Ohh yes, peppermint is a must in our house for at least one of our cookies around the Holidays! Hope you enjoy! Oh Yummy! White chocolate and peppermint crumbles sound like they would great together. Putting these on my holiday baking list! Let me know how you like them Katharine, and be sure to come back for the last 5 days of the Baking Frenzy! These sounds soo good. I need one now! Pingback: Butter Lemon Snow Drop Cookies - Day 11 - THE OLIVE BLOGGER - Recipes your family will love!